The model with hydraulic locking does not require the instal­lation of electric locks and guarantees that the leaf is me­chanically blocked when the motor is not in operation. The model without hydraulic locking always needs one or more electric locks to guarantee that the leaf mechanically locks. 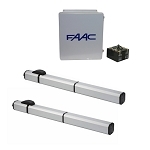 The S450H automated systems have been designed and built to automate swing-leaf gates. Avoid any other use, whatsoever.